During this expedition, the on-ship team is being joined by several Explorers-in-Training, two visiting scientists, and one NOAA Teacher at Sea. Meet these members of our team below. Since I was born in Halifax, Nova Scotia, I have grown an affinity for my Canadian coast and its culture. I grew up with an active lifestyle involving sports such as hiking and biking. These helped grow my love for science and exploration. Once I finished post-secondary schooling, I set off to travel to a few locations around the world and started seeking more information about the ocean. My developed interests and experiences eventually led me to choose the subject I pursue today, which is marine geomatics. In 2016, I started the Ocean Mapping program at the Marine Institute of Memorial University of Newfoundland. Throughout my program, I have learned about the various types of hydrographic methods, equipment, and software we have developed to help better define our seafloor. My courses have also taught me an appreciation towards various oceanic systems and their effects on how sound travels through the water column. I still have two years left until I complete my program in 2020; however, the Marine Institute has already opened many doors into the industry of ocean mapping for me. I have taken part in ocean-based conferences such as the 2017 Ocean Protection Plan Workshop in St. John’s Newfoundland, and the 2018 CHC-NSC conference in Victoria, BC. These helped me learn about current advances in ocean-based technology and plans to improve our regulations of ocean-based activities. Furthermore, in the winter of 2018, I joined the Canadian Ocean Mapping Research and Education Network (COMREN) in a project with the Marine Institute to bring hydrographic research to communities and improve the bathymetric knowledge in northern Canada. My work and experiences have led me to NOAA Ship Okeanos Explorer, where I hope to learn more about the application of hydrographic surveying. I am captivated to discover more about how the mapping team processes its data and how it can be used to study what lies under the sea surface. My experience aboard the vessel will be significant in developing my abilities as a hydrographic surveyor and researcher. 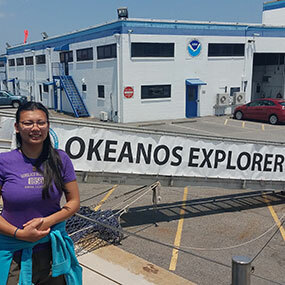 My name is Savannah Goode and I am a Mapping Explorer-in-Training aboard NOAA Ship Okeanos Explorer. This past May, I received my B.S. in Biological Sciences from Florida State University (FSU), where I spent much of my time working with Dr. Amy Baco-Taylor studying deep-sea invertebrates. While working in Dr. Baco-Taylor’s lab, I completed two independent projects: 1) examining spatial trends in macrofaunal community structure of the DeSoto Canyon in the Gulf of Mexico and 2) identifying and investigating factors controlling community biodiversity on Mokumanamana in the Northwestern Hawaiian Islands. 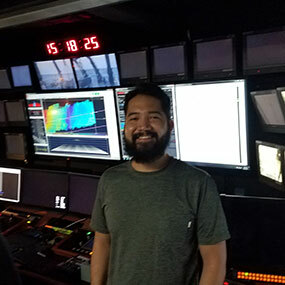 I also had the amazing opportunity to be a student scientist aboard the R/V Ka’imikai-O-Kanaloa (KOK) last October, assessing the recovery of deep-sea coral communities on seamounts from past trawling events. While on the KOK, I completed five submersible dives and assisted pilots with sample identification and collection. I had previous experience identifying many of the coral and sponge species we observed during our dives from autonomous underwater vehile (AUV) images, but I had never seen these species live and in-person before. It was amazing to see so many species and different seafloor habitats during dives, and after the completion of our cruise, I could not wait to get back out on a research vessel again! Therefore, when I heard about NOAA’s Explorer-in-Training program, I thought it would be a great opportunity for me to not only gain more experience at sea, but also to use a multibeam bathymetric sonar mapping system and analyze the subsequent data. As much of our deep-sea research is becoming increasingly reliant on multibeam technology, learning to use these mapping systems will prepare me for a career in the ocean sciences and make me competitive in the field. I also hope to learn from other scientists and engineers participating in this cruise, and this will hopefully help guide my future career plans as well. After the completion of this cruise, I want to complete a PhD in biological oceanography with a focus on deep-sea coral communities. I am interested in deep-sea coral, specifically, because there are still many gaps in our knowledge of the environmental drivers of dispersal and diversity of these coral communities. As deep-sea communities come under increasing threats such as trawling and mineral mining, our understanding of these environmental drivers can be crucial to developing successful management strategies to conserve and/or recover these species. I hope to not only contribute to our overall understanding of deep-sea coral communities, but also to identify actions that can be taken to protect these communities. I am Tatum Miko Herrero, a PhD Candidate at Christian-Albrechts-Universität affiliated with GEOMAR - Helmholtz Centre for Ocean Research in Kiel, Germany. My research is about seafloor volcanism in the North Atlantic Ocean, and I have been working with transit multibeam data to identify volcanic features, including sites that may indicate young volcanism on very old crust. I am joining this Okeanos Explorer research cruise as a visiting scientist and will participate in mapping the seafloor south of Bermuda. This area is of particular interest to me because of the unique seafloor signature of the 100 to 120 million year old crust. The data from this cruise will help patch up the holes in my maps and give a clearer picture of the features of the ocean floor. Greetings from NOAA Ship Okeanos Explorer! 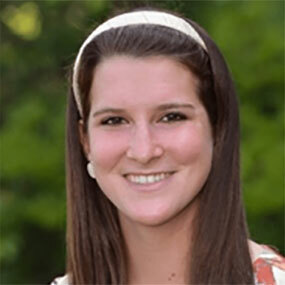 My name is Sally Jarmusz, and I am very fortunate to be an Explorer-in-Training on board. I will be working with and learning from an extremely talented science team, ship’s crew, and fellow interns. While on board, I will be assisting the science team in conducting seafloor mapping in an area southeast of Bermuda. The path that led me to being on this fantastic research vessel started when I was very young. Growing up in Georgetown, a small island in Maine, I was exposed to the wonders of the ocean at an early age. Watching the waves crash on the beaches, exploring tidal pools, and seeing the boats sail in and out of our local harbor fascinated me and made me realize that I want to spend my life on the sea, exploring the mysteries of the ocean. This passion for the marine world led me to attend Maine Maritime Academy, where I am a rising senior. I am currently in a five-year program studying for a Bachelor of Science in Marine Science and an Associate’s in Small Vessel Operations with a minor in Sail Training. As part of my Marine Science program, I am working on my independent Senior Research Capstone Project, where I design and implement my own scientific research. As part of my project, I am using sidescan sonar to create a map depicting the sedimentary environments of the local harbor at Maine Maritime Academy. My hope is that through my time on board the Okeanos Explorer, I can hone my developing skills in collecting and interpreting sonar imagery. My fascination in seafloor mapping grew as a Student Opportunity Participant on board R/V Falkor. 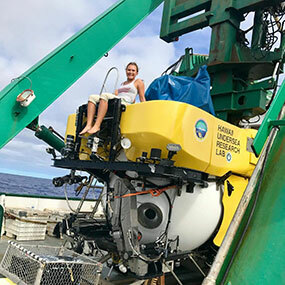 On the Falkor expedition, I participated in a seafloor mapping project covering an area near the Phoenix Islands Protected Area (PIPA) in the South Pacific Ocean. Through this experience, I came to truly appreciate not only the vastness of the open ocean, but how much of what lies beneath it has yet to be explored. My passion for ocean exploration and working on research vessels led me to apply to be an Explorer-in-Training on board the Okeanos Explorer, and I am eager to learn everything I can about the science operations and research processes conducted on this vessel. As a student studying both marine science and boating, I am beyond grateful to be a part of the offshore opportunities on board the Okeanos Explorer. I am deeply attached to working on board ships in addition to marine science, and it is my life’s dream to able to work on board an active research vessel. Ultimately, I would love to hopefully join the NOAA Corps or work as a marine technician on board research vessels once I graduate. I am extremely grateful to be able to gain experience working on board the Okeanos Explorer, as this will help me grow in developing valuable shipboard skills and learn more about my passion for ocean exploration. 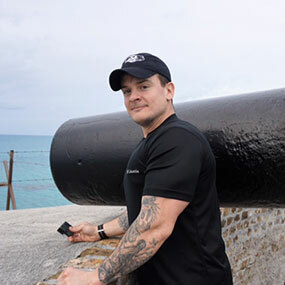 As we prepare to set off on the Mapping Deepwater Areas Southeast of Bermuda in Support of the Galway Statement on Atlantic Ocean Cooperation expedition aboard NOAA Ship Okeanos Explorer, I would like to take a minute to introduce myself. My name is Ryan Marr and I am an Explorer-In-Training (EiT) participating in the expedition. I am currently a master's candidate with the Maritime History Program at East Carolina University in Greenville, North Carolina. Having grown up in New Jersey, I was fortunate to be surrounded by numerous Revolutionary War sites and as a result, historical preservation has become a lifelong passion. My area of concentration is ethnoarchaeology, and I am currently working on a thesis discussing indigenous vessel design and construction techniques in the Tanga Region of Tanzania. I first became interested in East African history while studying KiSwahili with the David L. Boren Scholarship Program sponsored by the U.S. Department of State. My colleagues and I spent eight months in Arusha, Tanzania, serving as interns while continuing our language development within professional settings. Everyone in the program stayed with host families around the city, and my interest in ethnohistory began after hearing familial narratives from varying generations. The insight and perspective shared during these conversations demonstrated the need to include ethnographic data collection efforts when confronted with significant gaps in the historical record. My initial experiences in Tanzania proved invaluable when I was performing my field work this past summer. I was familiar with the cultural nuance and local vernacular that allowed an immediate trust to be established. Collecting personal narratives and local histories is a sensitive undertaking and it is essential to assure the participants of your academic motivations and the fact that your work will only serve to preserve their cultural heritage and facilitate its appreciation by the global community. My team and I traveled all along the northeastern coast visiting small fishing villages with resident ship construction experts to contrast data collected from larger port towns such as Pangani. It quickly became apparent that the Indian Ocean Basin and corresponding coastlines need to be explored using advanced deep-sea technologies to establish an understanding of the archaeological data now threatened by global security concerns. I first learned about the NOAA Explorer-In-Training program through my thesis advisor, Dr. Lynn Harris. As a maritime archaeologist, I have utilized magnetometers, sidescan sonars, and sea bottom profiling equipment in the search for potential shipwreck sites or other underwater anomalies. The opportunities to field such equipment, however, are often few and far between due to budget constraints and lack of access. 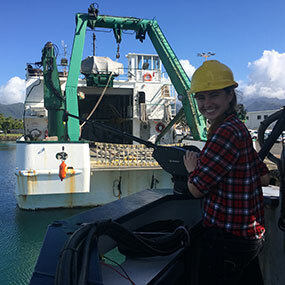 The EiT program will not only provide training on equipment normally off limits to graduate programs, but also give me the chance to begin to start the conversation with others who work within the oceanic realm. I will be able to learn about, investigate, and discuss issues with the marine research community and establish the connections that will prove instrumental when facing the critical issues of the future. The Okeanos EiT Program offers real-world training with multibeam sonars and sub-bottom profilers, as well as instruction in data processing that will allow me to return to East Carolina University and better prepare my colleagues to be scientific archaeologists. Our university has a close working relationship with NOAA and I hope to spur greater interest in deep-ocean maritime archaeology and to demonstrate the potential of such work. By participating in deep-sea operations and data collection, I will be able to raise awareness within our community regarding new trends in oceanic exploration and bring to light previously unknown problems within the field to allow everyone to operate in a safer and more efficient manner. After completing my master’s degree at East Carolina University, I hope to join the NOAA Corps and continue my service in uniform by assisting those carrying out the research critical to our survivability. 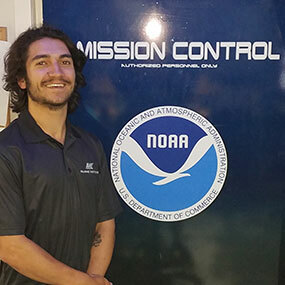 The NOAA Okeanos EiT Program will provide invaluable insight into vessel operations, research capabilities, and allow me to observe how to serve most effectively as a professional maritime officer. I just finished my fourth year teaching Honors and Regular Biology at the Peddie School in Hightstown, New Jersey. Peddie is an independent, co-educational boarding and day school for students in grades 9-12. In addition to teaching at Peddie, I work as the assistant Girls’ Soccer Coach, assistant JV Girls’ basketball coach, and Dorm Supervisor in a sophomore level Girls’ dorm. Our study body is comprised of 551 students from 23 states and 34 countries, so it is especially important that I create a curriculum that allows students to explore the world around them. Now more than ever, students are encouraged to gain experience with the scientific process by generating hypotheses, recording observations and data, drawing conclusions, and applying their knowledge. Since students are expected to create relevant connections between what they learn in the classroom and the real world, it is especially important for educators to be able to facilitate this. Therefore, being involved in hands-on research with the Teacher at Sea program will allow me to provide real life experience for those students interested in oceanographic and science related career paths. Next year, I plan on creating and teaching a Marine Science/Biology elective. Data collected from the expedition onboard the Okeanos Explorer will be utilized to design classroom activities, laboratory experiments, and cross curricular materials that directly relate to the research completed. Creating connections from the expedition will allow students to make associations between the ocean and their local ecosystems to put the research into context. Being involved with this unique opportunity will help me invigorate my classroom with a sense of wonder, discovery, and adventure. My name is Prian Vidal. I am currently aboard the Okeanos Explorer as an Explorer-in-Training (EiT) for the Bermuda Seafloor Mapping Cruise. I am a second-year master’s student in NOAA Center for Coastal and Marine Ecosystems (CCME) at Florida A&M University (FAMU). As a CCME scholar, I apply an interdisciplinary approach to address issues confronting marine and coastal communities. Nutrient enrichment, particularly nitrogen and phosphorus, has been identified as one of the leading causes of harmful algal blooms and hypoxia in the coastal waters. I study nitrogen transformations occurring in shellfish aquaculture operations. Shellfish are filter feeders and as they extract particles from the water column, they are removing nitrogen and other nutrients from the system. My master’s thesis will determine the impact, if any, of oyster aquaculture operations on eutrophication off the coast of Panacea, Florida. I learned about the NOAA Okeanos Explorer-in-Training program through the Center at FAMU. I do not have a background in remote-sensing equipment and bathymetric data, and I have never been at sea for an extended period. When I first read about this opportunity, I jumped at the chance to be selected as an EiT. I saw this as an opportunity to experience life at sea and to work with multibeam sonars and sub-bottom profilers. The EiT program is providing the opportunity to learn how to work with large sets of bathymetric data that will be collected daily for a 24-day expedition. I am excited for the chance to learn these valuable skills and about the day-to-day operations of maintaining a research vessel at sea. I hope to take back home my new-found knowledge of deep-sea operations and data collection and provide my colleagues and community insight into current expeditions and their importance on maintaining a healthy blue economy.